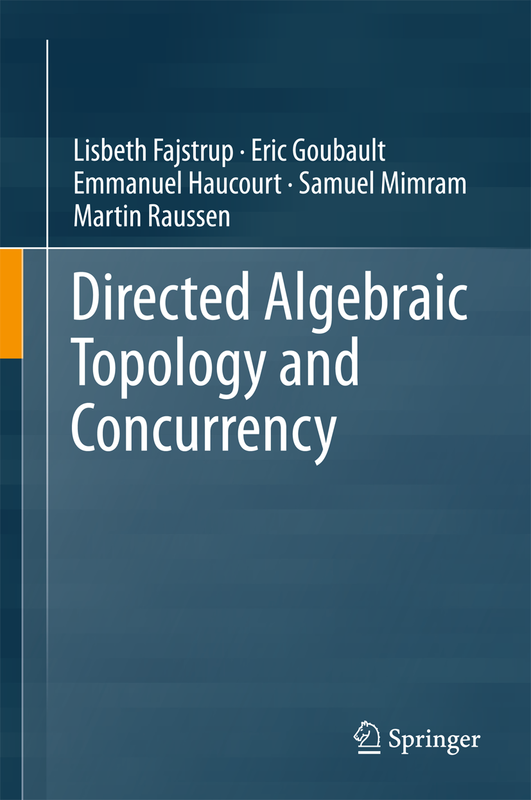 I am glad to announce that our book entitled Directed Algebraic Topology and Concurrency is finally out! More details can be found on the dedicated webpage: http://www.springer.com/book/9783319153971. This monograph presents an application of concepts and methods from algebraic topology to models of concurrent processes in computer science and their analysis. Taking well-known discrete models for concurrent processes in resource management as a point of departure, the book goes on to refine combinatorial and topological models. In the process, it develops tools and invariants for the new discipline directed algebraic topology, which is driven by fundamental research interests as well as by applications, primarily in the static analysis of concurrent programs. The state space of a concurrent program is described as a higher-dimensional space, the topology of which encodes the essential properties of the system. In order to analyse all possible executions in the state space, more than “just” the topological properties have to be considered: Execution paths need to respect a partial order given by the time flow. As a result, tools and concepts from topology have to be extended to take privileged directions into account. The target audience for this book consists of graduate students, researchers and practitioners in the field, mathematicians and computer scientists alike.